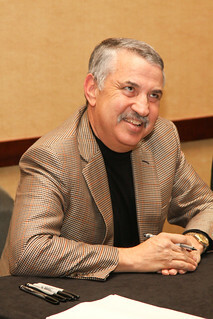 Thomas Friedman really is a gift to the world. As a long established New York Times columnist and author of many widely touted books, he is a great source of insight into establishment thinking. He comes through brilliantly in his column today. Friedman's basic story is that the two parties need to work out compromises, like the "Grand Bargain" on the budget, that President Obama tried to negotiate in 2011 with then Speaker John Boehner. Friedman blames the intransigence of the Republicans for failing to come to an agreement on this and other important issues. He argues that Trump is where this extremism gets them. His hope is that now the Republicans will move to the center and work out the deals that Friedman would like to see. "In this vortex [the 2008 economic collapse and the political polarization that followed] a lot of the public got unmoored and disoriented, opening the way for populists with simple answers. Get rid of immigrants, end trade with China or eliminate big banks and all will be fine. It's nonsense." Friedman is right that it is nonsense, but it is also not what anyone is saying. Even Donald Trump doesn't propose getting rid of all immigrants, which is not to say that his plan for departing 11 million unauthorized immigrants is not absurd and inhumane. And neither Trump nor Sanders proposed ending trade with China. And, while Sanders agrees with many leading economists that breaking up the big banks is important, he has certainly never implied that this would somehow make everything fine. In short, Friedman is making up absurd positions, attributing them to the people he doesn't like, and using this as an excuse to throw them out of the discussion. He wants to leave it to the real experts. Okay, let's see how the experts have done, starting with some of the details of the "Grand Bargain." As Friedman reminds us, a big part of the Grand Bargain was cutting Social Security and Medicare. Is it really true, that in a world where few workers now have traditional pensions and most are not able to accumulate substantial sums in 401(k)s or other savings, Social Security is too generous? The vast majority of the public does not hold this view. On what basis has Thomas Friedman decided it is true? With Medicare the problem is a wasteful health care system, not the coddling of the over-65 population. One of the ironies, that has apparently escaped Friedman's attention, is that the slowdown in health care cost growth over the last six years has actually led to more savings in Medicare than had been sought by Bowles and Simpson in their deficit cutting plan that was the basis for the Grand Bargain. Of course the whole idea that we needed to reduce the deficit in an economy that was and is still well below its full employment level of output is wrong. Had the Grand Bargainers gotten their way in 2011, the recovery would have been even slower and weaker. But this is the real story of the establishment. After all, the 2008 crash was not a rare weather event that struck the country and the world unexpectedly. It was the result of the incompetence of our country's leading economists in both parties. They could not see the dangers in an $8 trillion housing bubble. A similar story applies in foreign policy circles, where many foreign policy experts were prepared to believe the Bush administration's transparent lies about Saddam Hussein's weapons of mass destruction. And, they actually thought that the United States could go into Iraq and put in place a stable government that enjoyed popular support. The amazing part of the story is that the establishment types pay no price for being wrong in really big ways in their areas of expertise. This is best exemplified by Friedman himself. He can be wrong on every single thing he writes, every day of his life, and it will not in any way jeopardize his standing as one of the country's most respected commentators on policy and politics. And he wonders why the public is angry.